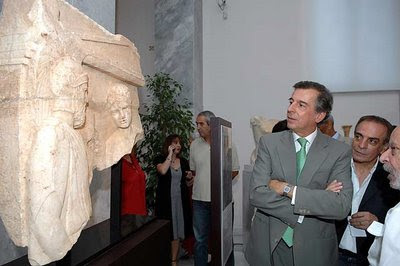 Mihalis Liapis stepped down as the Hellenic Minister of Culture on January 8, 2009 after 16 months in office (press release). The incoming minister is Antonis Samaras. Liapis placed Greece's cultural claims firmly on the international stage through the hosting (in March 2008) of the UNESCO conference in the New Acropolis Museum. He has strengthened links with Italy that led to the Nostoi exhibition in Athens. This coincided with the return of fragments of the Parthenon from Palermo and the Vatican. But he has also initiated claims on more recently looted material; recent returns include an Attic marble funerary lekythos from a Swiss dealer, and two pieces from the Shelby White collection.